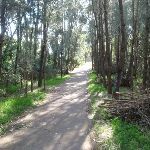 From the intersection, the walk follows the road up the gentle hill, passing the entry ticket booth and coming to the intersection with Henry Lawson Drive. 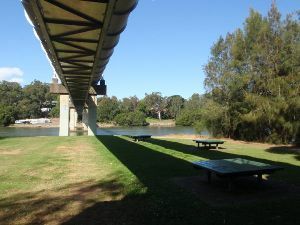 Turn right: From the intersection, the walk follows Henry Lawson drive, keeping Georges River to the right. 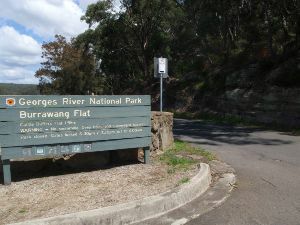 The road bends to the right and soon reaches Boomerang Reserve, on the left. 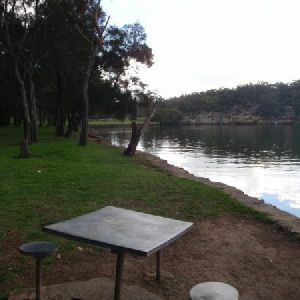 This relatively small park can be found on Henry Lawson drive, between the Little Salt Pan creek and The River road. 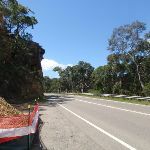 The park is surrounded by dense forest on three sides and a small timber barrier on the road side. 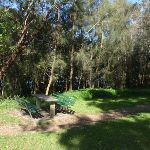 The park has a few sheltered picnic benches and a large map of Bankstown that was erected by the local Rotary club. There is plenty of open space and a few nice large trees for shade. 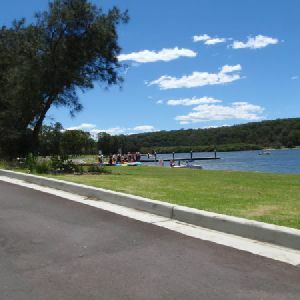 Continue straight: From the intersection, the walk follows Henry Lawson drive, keeping the river to the right. 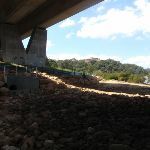 The road crosses the Little Salt Pan creek bridge then heads up to the intersection with the Georges River service trail, on the right (approximately 150 metres past the bridge). Turn right: From the intersection, the walk follows the service trail away from the road, around the metal gate and towards Mickeys Point. 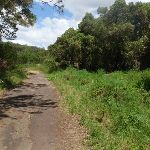 The trail winds past mangroves and through thick bush until it comes out at a large open clearing. At the other end of the clearing the service trail ends at a small turning circle. 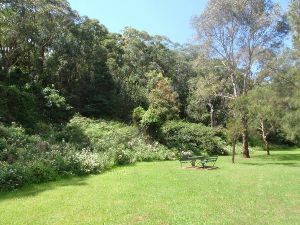 Continue straight: From the end of the service trail, the walk follows the bush track through the long grass towards the river. 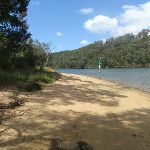 At the river, the track turns left and meanders up and down along the side of the river, until reaching the start (western end) of a long sandy beach. 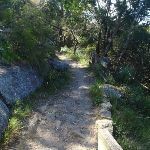 Continue straight: From the end of the bush track, the walk follows the beach (keeping the water on the right). 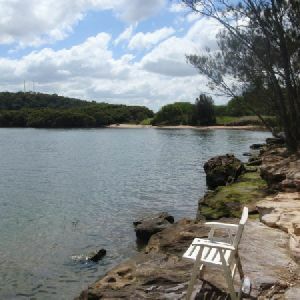 The walk stays on the beach until reaching the base of the large Alfords Point bridge. 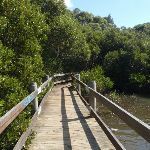 Continue straight: From the base of the bridge, the walk heads off the sand and winds around mangroves and through reeds (keeping the river on the right). After the clearing on the left, the walk comes to the sandy One Tree point service trail, near the trees. Veer left: From the intersection, the walk follows the old service trail away from the river. The trail passes through the reeds and the pine trees as it winds up a steep rocky hill. 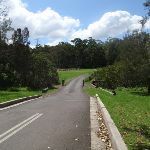 At the top of the hill, the trail passes under the powerlines, bends to the left and soon reaches an intersection with a bush track, to the right. 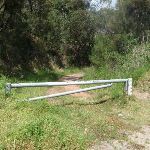 Continue straight: From the intersection, the walk follows the bush track beside the powerlines up the small hill to the metal gate at the bend in Playford Rd. Turn right: From the intersection, the walk follows the footpath along Playfords road to the north-east, keeping the road on the right. 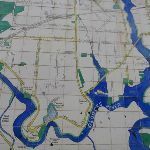 The walk continues to follow Payford Rd when it bends to the right (at the intersection with Roma avenue), then turns left into Dilke road at the ‘T’ intersection. The walk continues to the intersection with Villers Rd (there is a corner store and public phone on the left plus a large water tank on the right). This great little convenience store can be found on the corner of Villiers and Dilke Roads, and serves hot food, ice creams and cold drinks, as well as many convenient groceries. There is a public phone out the front. The store is open 7 days. Turn right: From the intersection, the walk follows Villiers road east (initially keeping the water tank on the right). Soon, the walk turns left onto Queensbury road and follows it, before turning right at the ‘T’ intersection onto Richmond avenue. The walk immediately turns left onto Riverview road, and continues to the end of the road. Turn left: From the end of the road, the walk follows the concrete footpath (following the power lines) between house numbers 5 and 6. 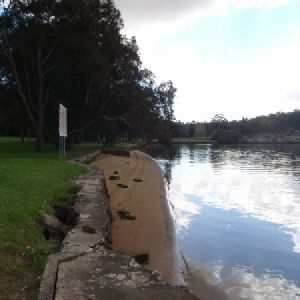 After a short distance the walk reaches the footpath on Henry Lawson Drive. 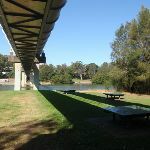 Turn right: From the intersection, the walk follows the footpath on Henry Lawson drive down the hill, (keeping the road on the left) towards the bridge. 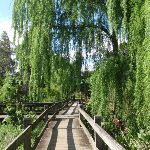 Just before the bridge, the walk comes to the top of a wooden staircase, to the right. 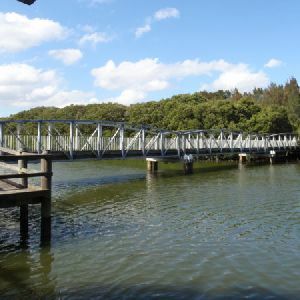 Turn right: From the intersection, this walk follows the boardwalk down the wooden staircase and loops around under the bridge. 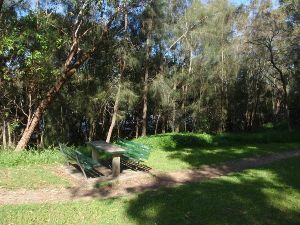 The walk passes a few picnic chairs and winds around through some mangroves, following the boardwalk to the intersection of the Alma Road concrete footpath track on the left. 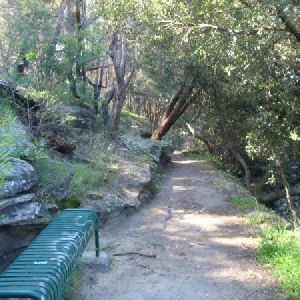 Turn right: From the intersection, this walk follows the footpath north (keeping the river on the right) onto a bush track and then up some wooden steps. 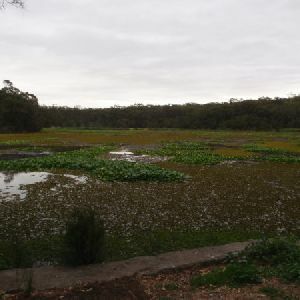 The track continues along for a while until it drops down some more steps to the Salt Pan creek picnic area. 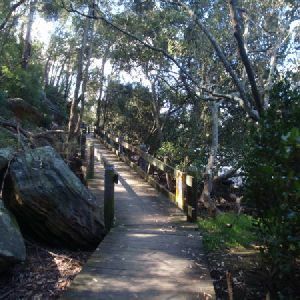 Continue straight: From the picnic area, this walk follows the bush track up the steps (keeping the river on the right) and winds along the side of Salt Pan Creek until it drops back down some steps onto a boardwalk. 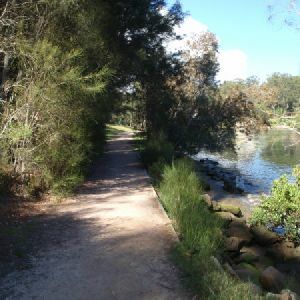 The track continues along the boardwalk, alongside the creek, until it comes to the bottom of Weenamana Place steps on the left. 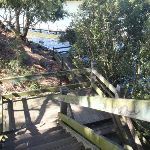 Continue straight: From the bottom of the steps, this walk follows the boardwalk as it winds alongside the river (keeping the river on the right), through mangroves for a short while. 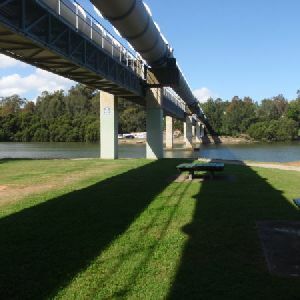 Soon the boardwalk becomes a bush track and continues to the picnic area under the large pipe bridge. 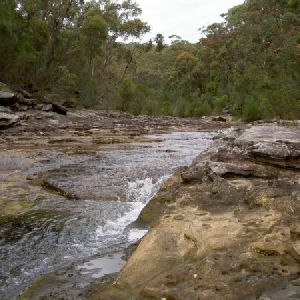 Continue straight: From the picnic area, the walk follows the hardened management trail (keeping the creek on the right) as it winds along the side of the river. 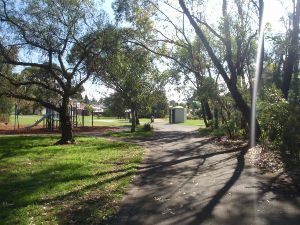 The walk passes a fenced-off area on the left before it turns left heads up the hill, coming near to the play equipment at Davies Reserve. 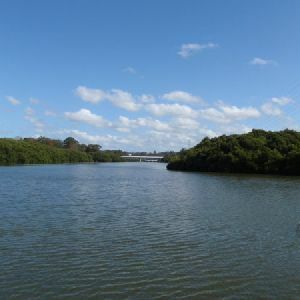 Turn right: From Davies Reserve, this walk follows the fenced boardwalk running parallel to the power lines, keeping Salt Pan Creek on the right. The track passes through the wetlands for a short distance, coming to an intersection with the Truro Parade boardwalk on the left. 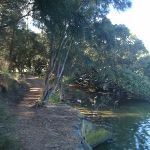 Turn left: From the intersection, this walk follows the boardwalk around the creek’s edge (keeping the train line on the left) and through some mangroves for a short distance, until coming to a concrete footpath. This path continues past a transmission tower to the end of Bridge Street. Turn left: From the car park at the end of the street, this walk follows the foot path along Bridge Street to the ‘T’ intersection of Davies Road, where the walk turns left. 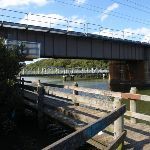 Following the footpath, this walk soon crosses the railway bridge and comes to the intersection with Meager Avenue. Continue straight: From the intersection, this walk heads south (away from the trail line) along Davies Road, along the footpath. After a short while, the walk turns right into Ryan Rd, crossing at the traffic lights. This walk follows the footpath through the suburbs to cross, straight ahead at the roundabout, onto Howard Road. The road then passes a few shops and comes to the Padstow railway station on the right. 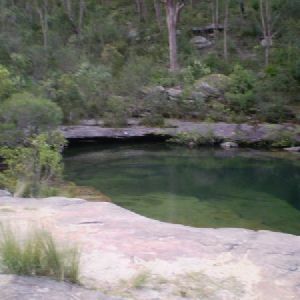 4.5km of this walk is flat with no steps and another 3.1km has gentle hills with occasional steps. The remaining (450m) has short steep hills. 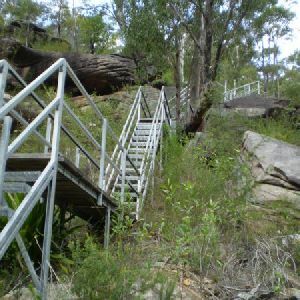 4.1km of this walk follows a smooth and hardened path and another 2.2km follows a formed track, with some branches and other obstacles. 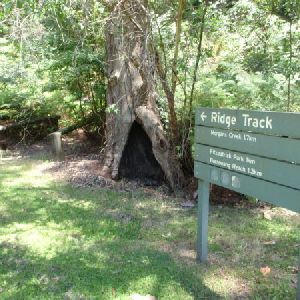 The remaining (1.8km) follows a clear and well formed track or trail. Around 5km of this walk is clearly signposted, whilst the remaining 3km has directional signs at most intersection. 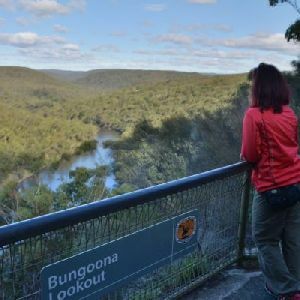 Around 6km of this walk requires no previous bushwalking experience, whilst the remaining 2.2km requires some bushwalking experience. 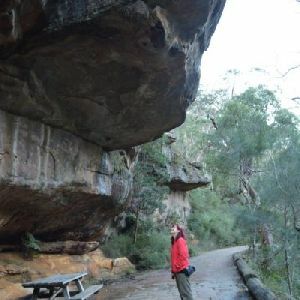 Around 7km of this walk is close to useful facilities (such as fenced cliffs and seats), whilst the remaining 730m has limited facilities (such as not all cliffs fenced). 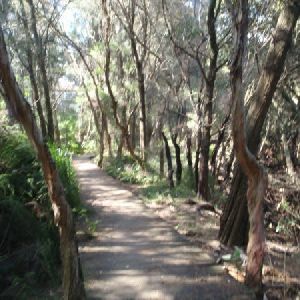 A list of walks that share part of the track with the Morgans Creek to Padstow walk. 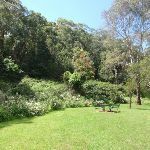 A list of walks that start near the Morgans Creek to Padstow walk. 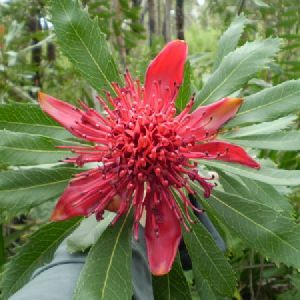 http://new.wildwalks.com/wildwalks_custom/includes/walk_fire_danger.php?walkid=nsw-georgernp-mctp Each park may have its own fire ban, this rating is only valid for today and is based on information from the RFS Please check the RFS Website for more information.